There will be a talk about the history of the piece 45 minutes before each performance. Antonio Lucio Vivaldi was born on 4 March 1678 in Venice then a rich, though declining, republic. His father Giovanni (a barber who became a violinist) and his mother Camilla had six children in total. It seems that Giovanni decided that music would be a better career than barbering for his son so he taught him the violin from a very early age. It is not clear whether Antonio was encouraged to join the church because that was the best place for a musician or whether, as some have suggested, it was a natural occupation for the eldest son of a poor family. Vivaldi began his training for the priesthood in 1693 when he was 15 and was ordained in 1703 at 25. In the year he was ordained Vivaldi became a violin teacher at the orphanage for girls the Ospedale della Pieta, a local school for homeless girls. Though a priest, Vivaldi was exempted from saying Mass on health grounds – he suffered from asthma – and so he concentrated on his music. The Pieta had an excellent choir and orchestra, drawn from the girls and young women living there. 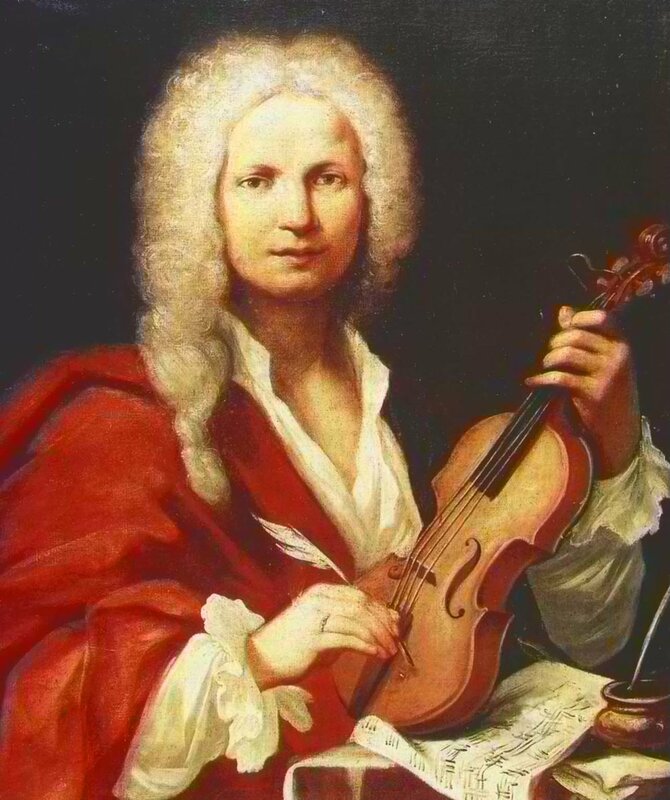 Vivaldi taught violin and composed sonatas, concertos and church music. The public paid for the musical performances but could not see the singers and players, who were behind the screen. By the second decade of the 18th century, opera had become hugely popular in Italy. Vivaldi composed his first opera Ottone in Villa in 1713 and it was performed in a theatre in Vicenza. It was a moderate success and over the next few years he wrote Orlando Finto Pazzo (1714), Orlando Furiosa (1714) and Arsilda Regina di Ponto (1716) as well as several that have been lost (or perhaps, not yet found). It 1717 or 1718 Vivaldi left Venice – it seems that he was not reappointed to the position at the Pieta – and took a position at the court in Mantua then part of the Austrian Empire. He kept a relationship with the Pietà though, and was paid to compose two concerti a month and to rehearse the orchestra from time to time. Vivaldi spent three years in Mantua and wrote several operas, including Tio Manlio. In 1720 the Empress died in Vienna and all theatres in the Empire were closed. Vivaldi returned to Venice and the Pietà. In 1721 he was in Milan and in 1722 in Rome. Operas were produced in both these cities but they have been lost. In 1725 in Amsterdam a collection of 12 concerti by Vivaldi, his Opus 8, was published under the title Il cimento dell'Armonia e dell’Inventione. The first four works in the collection were The Four Seasons, which have become, probably, the best known and most played compositions in the classical repertoire. By this time Vivaldi was at the height of his powers and fame. He wrote a cantata for the wedding in 1725 of Louis XV of France to the Polish Princess Maria. A second set of concerti, La Centra Op. 9, was dedicated to Emperor Charles VI. In 1730 Vivaldi was in Vienna and Prague, where the opera Farnace was produced. Not a lot is known about Vivaldi’s life during the 1730s. He was certainly prolific, concentrating mostly on opera, and he visited Mantua, Verona and Amsterdam. We do know that in 1735 the opera Griselda was performed in Venice’s Teatro San Samuele, from which Vivaldi had up until then been excluded. 1735 also saw the composition of Bajazet which reflects the Venetian preoccupation with Venice’s position on the edge of Asia, and the constant fear of invasion. Vivaldi’s popularity weakened in the late 1730s and, certainly, Venice was losing its prosperity. Vivaldi struggled to make money from his operas. The interest of Charles VI in Vivaldi’s music made Vienna attractive and Vivaldi went there in May 1740. However in October the Emperor died, and Vivaldi and opera were not first priority for Charles’s daughter Maria Theresa so Vivaldi’s career did not flourish. He continued to sell manuscripts to support himself but, it seems, composed nothing new while in Vienna. In July 1741 Vivaldi died of innerlicher brand, literally “internal fire”. He was buried as a pauper in the Hospital Cemetery. There are a number of operas written about the story of Pharanace II, King of Pontus, from composers such as Caldara and Corselli. Vivaldi's Farnace was originally written in 1727 and presented in Venice; though the materials for this version have been lost. Farnace was praised at the time for its 'sublime' and 'tender' qualities. Vivaldi revived it again in the Autumn in a revised version and presented yet a third in Prague in 1730. Then in 1731 he produced it in Pavia, in another and final revision. The score is one of the best from Vivaldi's late operatic period. The work reflects the latest trends in Neapolitan operas, with rich orchestration and extended virtuoso arias, and including rather more arias for the lower male voices than was usual and fewer da capo arias. The story tells of Farnace’s defeat at the hands of the Romans. To avoid their falling into the hands of the enemy, he commands his wife, Tamiri, to kill their son and then herself. Tamiri's mother, Berenice, hates Farnace and is in league with Pompey, the Roman victor, to kill him. Selinda, Farnace's sister, is taken captive by the Roman Aquilius, who falls in love with her, as does Berenice's Captain, Gilades. Selinda plays them off one another in an attempt to save her brother. Somehow, it ends happily and everyone is spared.